Check these budget-conscious ideas to make your Valentine’s Day even more special by staying home! Crowded restaurants, gimmicky special offers, cheesy decorations . 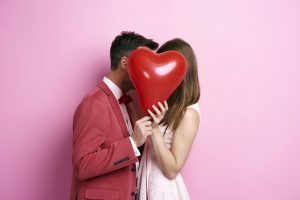 . . how romantic is a Valentine’s Day date, really? If you know what you’re doing, you can actually have a much more romantic evening without going out. Here are our top tips for enjoying Valentine’s Day in the Atlanta Gas & Light service area without leaving your home. If you’re staying in, you want to maximize the benefits you get from Valentine’s Day in your own home. Instead of being in a jam-packed restaurant, wedged in a corner by the bathroom, make the most of your comfortable surroundings. Turn the heating up higher than usual for some cozy ambiance (if you’re not on a cheap natural gas deal, it’s not too late to switch natural gas provider). Tidy the place up, too – this will give you more of a sense of space, feeling more at home. Okay, so your living room might not have the natural charm of a quaint little restaurant, but there’s still a lot you can do. Candles are the go-to option for romantic mood lighting – set a few around the room to provide a romantic atmosphere. Fairy lights are also excellent for providing low-level lighting, and a few battery-powered strings can be easily put in place wherever you want. A crackling log fire is best, but be sure to be safe when using your fireplace. Since it’s your home, you also have control over the music. Think carefully about what sort of mood you and your partner would most enjoy; a little light jazz, some classical piano, or something a bit more atmospheric and ambient? Put together a playlist or find one of the many ready-made compilations online. OK, we can’t all cook, but even a little effort goes a long way when it comes to making a romantic meal. Don’t feel like a three-course extravaganza is needed – you can use convenient and energy-efficient cooking techniques like slow-cooking to put together a delicious meal without lots of effort. It goes without saying that you should take care to set the scene for the meal; a clean tablecloth, candles and flowers all go a long way to making dinner feel special. A key part of any romantic date is an idea of where the night goes next. Don’t finish off dessert and be left at a loose end, or you’ll find yourself quickly slipping back into domestic mundanity. Plan ahead; have a romantic movie on standby, or wrap up warm and go outside to look at the stars. Whatever you do, find something to keep the magic going – leave the dishes ’til tomorrow. Another big benefit of avoiding a traditional Valentine’s Day date night is the unnecessary expense. A night in can be every bit as perfect as a night out, if you plan ahead and make a little effort, and it’s also often easier on the bank account. You can keep these sensible habits going throughout the year by picking up a cheap fixed rate natural gas plan at the same time. Save money and keep warm throughout the year with the best natural gas providers in Georgia.